The moon is full so we don’t need flashlights as we follow our tracks back to the camp. It’s late (almost 9:30 pm) and everyone is very tired after a long day of moving snow. 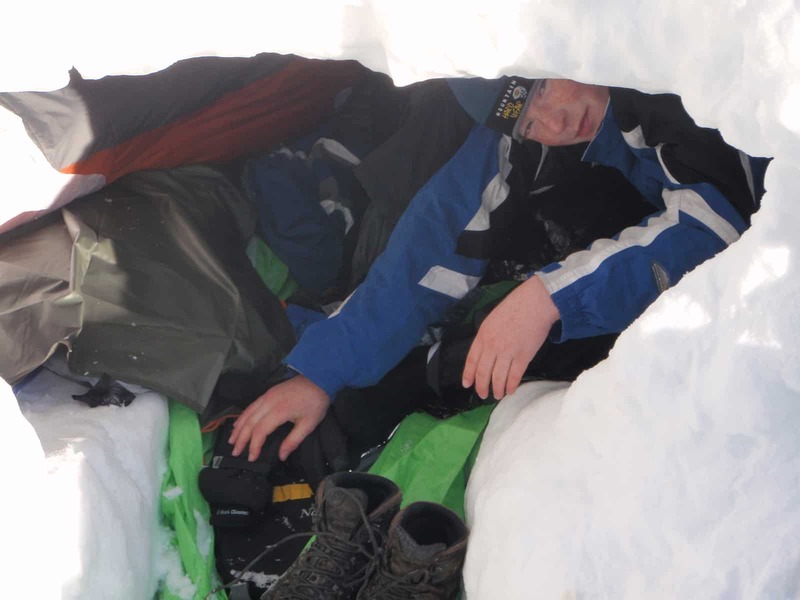 Scouts find their cave entrances, unclip their snow shoes, and crawl inside. The thick walls of the cave create an acoustically perfect environment, where even the loudest forest noises cannot be heard. Glow sticks pushed into the walls cast cheerful red and green shadows. Inside, the cave feels like an icy Cathedral – reverently aglow with votive candles. Outside the temperature has dropped to an inhospitable 20 degrees. 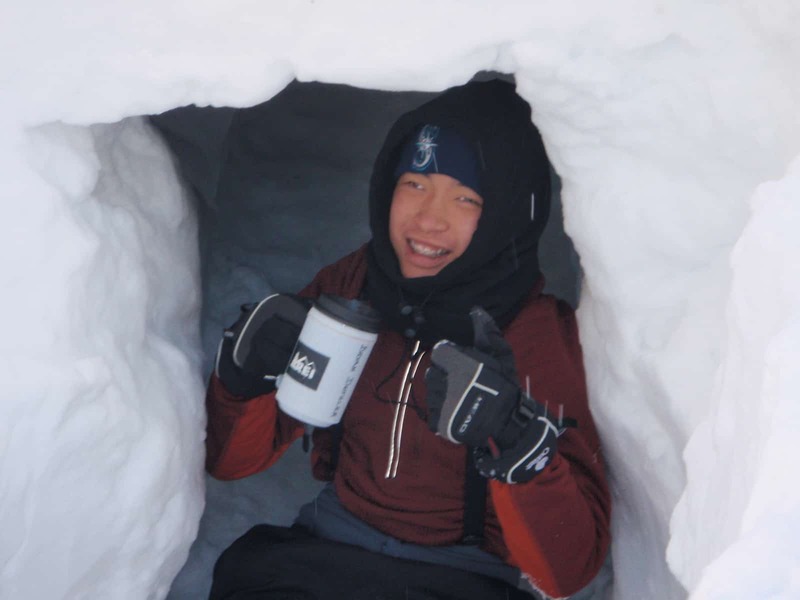 Snow caves can seem cramped to large teenagers. 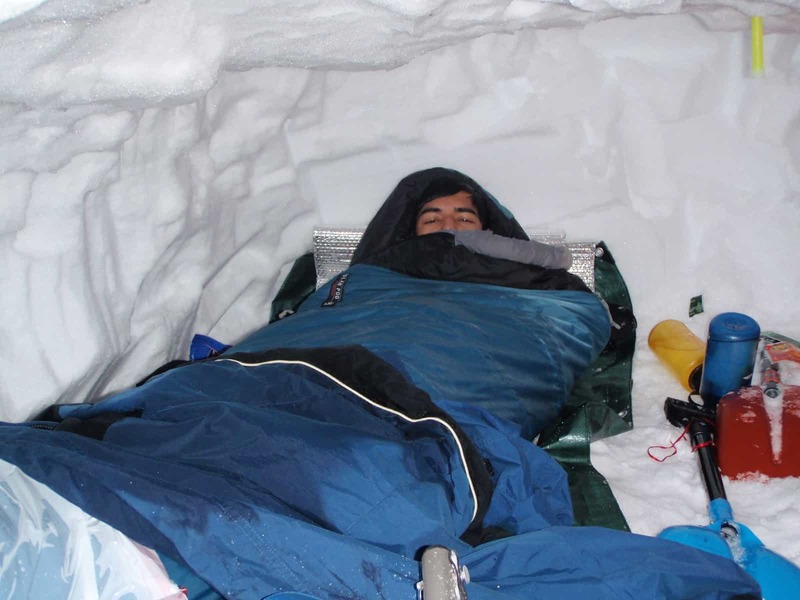 Packed snow is as hard as an ice cube and it’s not comfortable to sleep on, even with a thermal pad. And if the roof of the cave isn’t properly smoothed by hand, drops of water will fall onto sleeping bags and equipment throughout the night. 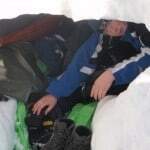 Experienced snow campers use their shovels to scratch out a wide trough in the snow at hip level and take the time to run gloved hands across the roof to remove all the imperfections – so moisture is properly channeled down the sides of the cave. Most of the Scouts don’t bother with either. They are far too anxious to stop digging and get their stuff inside to worry about creature comforts. Consequently, for many first timers, it’s a long night, turning like rotisserie chickens trying to get comfortable on their hard sleeping platform. Scout trying to sleep in a cave. When the sun climbs high enough in the morning, the snow around the entrance lightens and fills the cave with enough daylight to encourage the Scouts to start moving around. Overnight, the roof of the cave has naturally settled about 10 inches, making the cramped space even smaller. 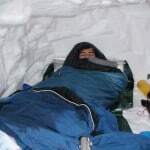 The hardest part of the outing is sliding out of a warm sleeping bag and carefully maneuvering into cold clothes and frozen boots without getting too wet. This is not a good place for people with claustrophobia. The cooks are up first, working on the frozen stoves and trying to boil water for breakfast. One by one, young men crawl out of their caves and congregate in the kitchen area, staring at the flames of the stoves and wishing there was a fire over which they could warm their hands. The group shifts their weight from foot to foot in unison and claps their hands and arms to their shoulders in order to increase blood circulation. It almost feels warm when the sun breaks over the trees and bathes everyone with direct sunlight, but the thermometer still reads 28 degrees. Drinking hot Tang from an insulated cup. Breakfast consists of Dinosaur Egg oatmeal, hot Tang, and loads of pre-cooked bacon, which smells really good as it is heated in the pan. We line up, pour boiling water into our Oatmeal packets and argue over how many pieces of bacon to take. We settle onto the snow benches to eat. Two campers soon grab the extra oatmeal packets, but everyone else is temporarily full. We lick our bowls, pour the remaining hot water into them, rub with our fingers, and drink the grubby water so it doesn’t contaminate the environment. 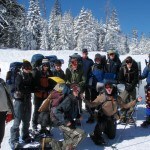 Scout’s Own is celebrated on a hill overlooking the snow-covered lake, under a clear blue sky, surrounded by snow covered trees. We can see our breath as the leader says a prayer (“Let us remember that we are in the Holy Presence of God.”) Then the group works its way through “Thorns and Roses,” where Scouts describe what they liked and didn’t like about the outing. Everyone is happy. There are lots of stories to tell friends and teachers at school on Monday. Scouts getting ready to head for home. 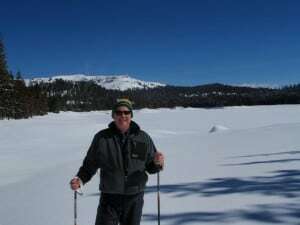 The second day of a snow camping trip is a more leisurely affair. The hard work is already done and the only thing left is to have fun in the snow. Scouts clear an area for sledding and ride their shovels wildly down the hill to land in the deep, soft powder. 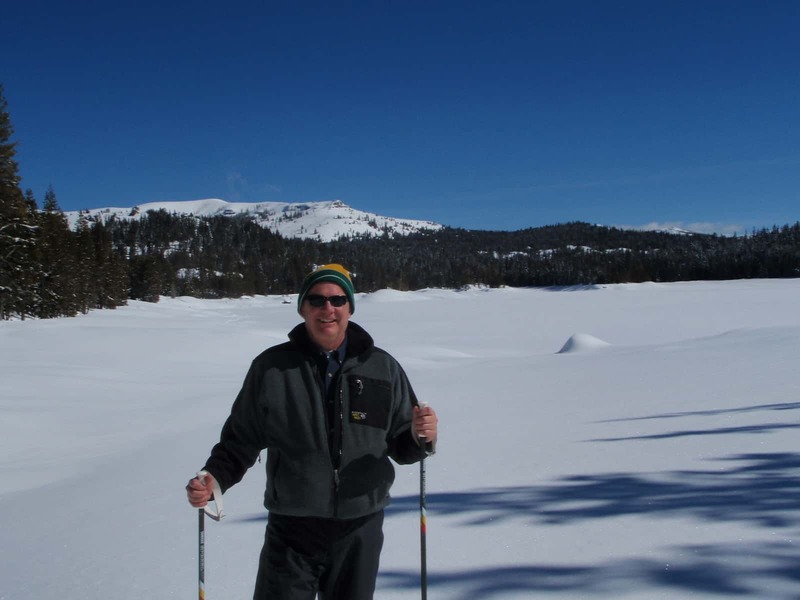 A group snowshoes goes off to explore the area. The sun is shining now, and we are sweating. Time to strip away some outer layers and begin to pack up. The leaders declare that we must start hiking back to the cars soon in order to make it home in time to finish their homework assignments. They complain about the stupidly of the homework and its lack of relevance. 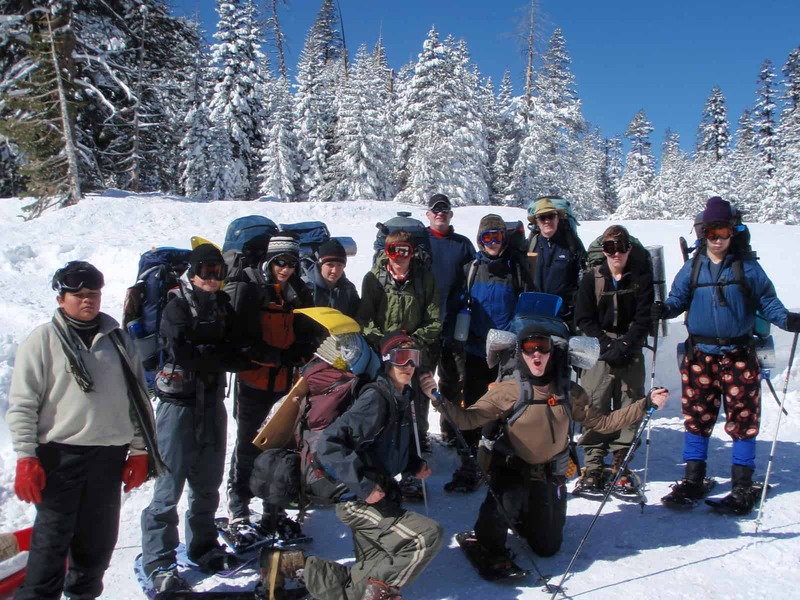 Every camper knows that there isn’t a homework assignment in the world that will teach them as much as a snow camping trip. After the Scout's Own, its time to explore.